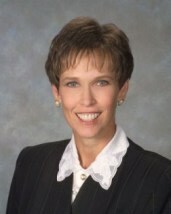 Janet L. Damore established her solo practice in October, 2007, and practices exclusively in the family law area. Janet earned both her undergraduate degree and juris doctor from the University of Kansas. Janet has a BV rating with Martindale-Hubbell Law Directory. Before establishing her solo practice, Janet was co-founder and senior member of Schlagel Damore Gordon & Kinzer, LLC, in Olathe, Kansas, and had been with the firm since 1993. Janet began her legal career with Kansas Legal Services where in addition to providing general legal services to lower-income clients, she served as Project Coordinator for the Domestic Violence Project and Project Coordinator for the Hospital Patient Assistant Project. Janet is a seasoned family law attorney and has extensive litigation experience in matters involving marital dissolution, child custody, support, division of marital assets, and paternity. Her family law practice encompasses the Kansas City metropolitan area and surrounding counties in Kansas and Missouri. Janet has been instrumental in introducing Collaborative Law to the Kansas legal community. She is a founding member of the Collaborative Law Institute of Kansas and served as its first President. She is also a practitioner member of the Collaborative Law Institute of Missouri. She has taught continuing legal education seminars on collaborative law, in addition to various other domestic law topics. Beyond her education and experience in the law and the collaborative law model, she has received training in basic mediation, Domestic Relations Mediation, and Domestic Case Management. Throughout her career, Janet has participated in several activities of the organized bar. For many years she was a member of the Family Law Bench Bar Committee of the Johnson County Bar Association. She also served as President of the Johnson County Bar Family Law Section. She is an active member of the International Academy of Collaborative Professionals, as well as the Johnson County, Kansas, Missouri and American Bar Associations. Janet was formerly an Associate in the Kansas Inn of Court and most recently a Barrister of the Earl E. O'Conner Inn of Court. Janet is committed to providing the highest quality of legal representation to her clients and she derives immense satisfaction from helping people through a very difficult chapter in their lives. The Damore Law Firm, LLC practices family law, collaborative law, and mediation in the Kansas City Metro representing clients in Overland Park, Leawood, Shawnee, Olathe, Prairie Village, Mission, Mission Hills, Johnson County, Miami County, and Wyandotte County, Kansas, and in Jackson County and Cass County, Missouri.